This week's tablehopper: Champagne wishes and caviar dreams. 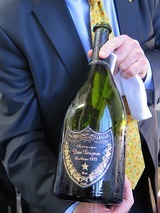 The belle of the ball: 1975 Dom Pérignon poured en magnum at GourmetFest 2015. Photo: © tablehopper.com. Howdy, friends. Hope your weekend was marvy. It was pretty epic weather, that’s for damn sure. I had a 24-hour jaunt down to Carmel for GourmetFest 2015, and man, did that live up to its name. I have a full recap of the extravaganza in today’s chatterbox, and a photo album here. Before heading out of town, I swung by Off the Grid for a preview tasting of their Friday evening event at Fort Mason, which is back in action. We could not have asked for better weather, seriously. Tablehopperette and I tasted piping hot momos from Bini’s Kitchen, some fantastic matcha cheesecake and tea drinks from T. Epiphany, Italian sausage and pepper buns from Happy Dumplings (fun), and fans of the 3-Sum Eats truck will be happy to know their truck is back with their fried chicken sandwiches. The new bar setup from Rye on the Road is as awesome as their drinks (Early Spring Julep for the win), and don’t forget you can pre- or post-party at The Interval as well. Wanted to make a quick note here that hopper associate editor Dana Eastland is road trippin’ to Portland toward the end of the month, and she’d love to hear any recommendations you might have! Where to dine, where to wine, whatever you’ve got, in Portland or along Highway 1. Email her your recos here, and thank you! Jersey, looking toward the front of the restaurant. © tablehopper.com. The Little Italy pizza at Jersey. Last week I had a chance to attend a friends and family test dinner for ~JERSEY~, the new Italian joint from Mitchell and Steven Rosenthal (Town Hall, Salt House, Anchor & Hope, La Capra). The brothers were Jersey boys, and so while pizza is an important part of the menu, you’ll also find pastas, roast chicken, and more. The chef is Ramona Rillo, who started as a line cook at Town Hall and then was a sous at Salt House. Starters on the lunch menu include ‘nduja and ricotta on crostini, a fun Jersey chopped salad (complete with salami, provolone, and peperoncini) plus three other salads, and ahi tuna arancini. The dinner menu expands to include a beef carpaccio (they’re using tri-tip from Snake River Farms) topped with fried artichoke and a creamy confit of garlic and anchovy sauce, and meatballs on crostini with tomato sauce and fontina-jalapeño béchamel. Yeah, they’re having some fun. For lunch, there’s a meatball sandwich, chicken Parm, a Jersey burger (with provolone and pancetta), and you gotta click the menu and check out the Goodfellas sandwich ($13-$15). There are also a couple of pasta dishes: bucatini and clams in red sauce ($10/$17), and pappardelle with guanciale Bolognese ($11/$18) and broccoli di ciccio (nighttime brings gnocchi and squid ink linguine with linguiça). As for the pizza, there are two kinds. The Jersey style comes in a 14-inch size, and the crust is just soft and elastic enough, with a developed flavor from the long proof they’re doing. (Mitch says the pizza started as a hobby years ago, and his starter is at least six years old.) There’s a Trenton tomato pie, a meaty New Yorker, and we tried the Little Italy, with soppressata picante from Zoe’s, mozzarella, provolone, and a delicious tomato sauce (ranging from $16.50-$19). You can also try the California-style pizza, which is 12 inches and cooked in a hotter oven; there’s a margherita, an asparagus pizza, and a bianca ($14-$16). Larger dinnertime entrées include roast pork ($23) and a diavola chicken ($19) with toasted bread salad. You’ll also find an easy-to-navigate wine list, full of Italian selections and some Cali picks too, with 15 by the glass. The beer selection is no slouch either, with nine on draught, like Drake’s nitro stout, Fort Point’s Manzanita altbier, and Ballast Point Longfin Lager. The space (by Sagan Piechota Architecture) was formerly the Toaster Oven, which you won’t even recognize. Now it has a clean and classic industrial-chic look, with exposed brick walls, a long bar (plus counter seating at the front window), dark wainscoting, and an open kitchen in the back, with a punch of Prussian blue on the wall and yet another counter facing the pizza oven. Reservations accepted. Hours are lunch Mon-Fri 11am-2pm; a limited menu between 2pm-5pm; dinner Mon-Thu 5:30pm-10pm, Fri-Sat 5:30pm-11pm. 145 2nd St. at Mission, 415-912-1502. Chef Olivier Roellinger at his outdoor cooking demo. All photos: © tablehopper.com. Chef Michel Bras helping to plate chef Francis Wolf’s dish at the Taste of France luncheon. L’endive farcie, parfum de truffes, by Michel Bras. The electric Ernst Loosen at his Mosel tasting and talk. Bonjour, gorgeous. A 1966 poured en magnum at the Dom Pérignon tasting. The lineup from the Dom Pérignon tasting. It was an honor to be invited back to GourmetFest 2015, a weekend-long event in Carmel by the Sea, with some heavy-hitting Relais & Chateaux chefs from around the world, along with top winemakers and sommeliers from France, Italy, and more. I drove down early Saturday morning, in time for the outdoor cooking demo with chef Olivier Roellinger (Les Maisons de Bricourt), who gave an interesting talk about the history of spices and how his use of spices was a challenge to traditional Breton cuisine back in 1982. For the Taste of France lunch that followed, he served a riff on one of his first dishes (John Dory, cabbage, and 14 spices). Another chef contributing to a lot of buzz at the luncheon was the presence of Michel Bras, who rarely leaves France for events. It was certainly enough for chef David Kinch to drive over for the day from Manresa, carting his first-edition cookbooks by Roellinger and Bras to have them signed. The ultimate fanboy! Bras’s dish at the luncheon gave almost everyone pause: a beautiful head of endive (cooked so nearly all traces of bitterness were gone), filled with a mix of bread, olive oil, and black truffle, and then napped in an ethereal cloud of a cream sauce and a flurry of more truffle. So deceivingly simple but actually so complex. The 2008 Château de Beaucastel Châteauneuf-du-Pape paired with the dish was also a smooth talker. The entire lunch was rather special; hop on over here for more pics. And it’s worth nothing the new event venue, Seventh & Dolores, was a nice change and step up from last year’s tent. After lunch, it was time for a fantastic wine tasting with Ernst Loosen of the Dr. Loosen estate in the Mosel. The man is so vibrant and energetic, the world needs more people like him (I thought he’s like the German Gary Pisoni). He walked us through the terroir, techniques, and a fabulous tasting of Wehlener Sonnenuhr riesling auslese vintages, including 1967, 1976, 1983, 1988 (loved the mushroom notes of this one), 1990, 1998, 2004, and 2011. What’s amazing is these “Erste Lage/grand cru” vines are more than 100 years old, with their original rootstock—they were never hit by phylloxera (the steep slopes and soil saved them). It was a fascinating talk, and if you ever have a chance to hear Ernie speak, you’re in for a treat. I managed to get a quick and slightly tipsy power walk in along the beach at sunset (what a dreamy location, really) and then it was time to strap the feed bag back on for the Grand Chef Dinner. Highlights included the warm ceviche by Diego Muñoz (Astrid & Gastón Casa Moreyra in Lima), the “risoni all carbonara” by Annie Féolde of Enoteca Pinchiorri in Florence), and the 2007 Calera Reed Vineyard pinot noir kept me in my happy place (and it was an honor to have the ever-stylin’ Josh Jensen at our table). You can guess who slept like a rock in her room at La Playa Carmel—I kept my window cracked to listen to the nearby waves and let in some cool night air (the air in Carmel by the Sea is so bracing and fresh). Sunday morning, time to rise and shine, time change be damned (of all nights I could have used that hour of sleep). I had a quick cappuccino and egg on toast at Carmel Belle—I needed to lay a little bedrock before walking into the 10:30am Dom Pérignon tasting, led by chef de cave Richard Geoffroy. It quickly turned into one of the most extraordinary Champagne tastings of my life (I count last year’s Krug tasting and the private tasting I had in September at Louis Roederer as the other two, thus far!). We tasted vintages spanning from 1990 to 2004, and the stars of the morning, three vintages poured en magnum: the complex 1966, the precise 1973, and the extraordinary 1975. It’s so rare to be able to taste these wines, and the fact they were transported directly from the Dom Pérignon library makes it even more special because you know they were stored perfectly. Tasting the difference between the vintages was so illuminating. It was actually quite moving, I’ll admit I got a little misty. And I wasn’t alone—the energy in the room was palpable. I walked out of there feeling like the lucky lady I am. I managed to snag a few quick bites at the Seafood Grill before heading back home—of course I needed to finish my 24-hour-luxury fandango with freshly shucked oysters from Taylor Shellfish topped with Siberian caviar from Black River Caviar, mmmhmmmm. Champagne wishes and caviar dreams, for real. Merci beaucoup to everyone who put on this very special event—the caliber of chefs, winemakers, purveyors, and more is quite marvelous, and the smaller scale of it keeps it feeling very special. For more pictures of the weekend, click on over here. A couple of exciting updates for you at burger and barbecue heaven, otherwise known as ~4505 BURGERS &AMP; BBQ~. First up, starting this Friday March 13th, their late-night cheeseburger window will be up and running. What this means is you can score the Best Damn Cheeseburger Friday and Saturday nights from from 11pm-1am. Oh yeah. Secondly, in case you were driving or walking by and saw their outdoor patio looking rather construction-y, it’s because their whole shipping container/groovy outdoor seating situation is finally under way! Remember when we initially wrote about the shipping container, complete with indoor and outdoor seating, heaters, skylights, and food runners who will be able to help you with more beers? Well, it’s finally happening! You can read all about it on Hoodline, who says 4505 hopes to have it all ready around the first week of May, just in time for their one-year anniversary. 705 Divisadero St. at Grove. Legume chaat with radishes, crispy boondi, and Szechuan pepper-verbena goat cheese at All Spice San Mateo. Photo from Facebook. ~GAME~, the restaurant that opened in November in the former Masa’s space, announced a changeup that will happen later this week. The restaurant is owned by Sachin Chopra and Shoshana Wolff, who also own All Spice in San Mateo, and they’ve decided to close Game and reopen as the San Francisco location of ~ALL SPICE~ on Friday March 13th. The All Spice menu is focused on modern American takes on Indian flavors, along with a special chef’s tasting menu. Check out the San Mateo location’s menu here. To celebrate their grand reopening, they’ll be throwing a party on Thursday March 12th to benefit HandUp from 5:30pm to 8pm. Tickets to the party are just $5 (though you can donate more) and include a complimentary tasting of Chopra’s planned menu. HandUp is a crowdfunding organization committed to helping communities help each other through direct giving. 648 Bush St. at Powell, 415-874-9481. A pic supplied to us of the always-smiling dine and dasher. Consider this a heads-up for restaurant owners: I have been receiving multiple emails about a serial dine and dasher, who has a penchant for dining at quality places all over town (reportedly including Bar Tartine, Urchin Bistrot, Locanda, Marlowe, Rich Table, Cavalier) and manages to keep evading that onerous bill-paying part of the dining experience. I spoke with a few restaurant employees who recounted their experiences with me, which basically goes like this: the diner, who goes by Glenn or Les, will sit at the counter or bar, for lunch or dinner. He’s extremely friendly, introducing himself to neighboring diners and the servers, sweet-talking everyone around him. He will go to the bathroom and outside to smoke numerous times, which gives servers a false sense of comfort when he isn’t in his chair because he soon returns…well, until he’s gone for good. He is well dressed, middle-aged, orders heavy (lots of wine and cocktails), and extremely smiley. He also seems to not own a wallet. Ahem. Anyway, here’s the additional problem: not enough restaurants are filing police reports on this guy. He has been cornered and the police have been called to pick him up a couple of times, but there aren’t enough restaurants pressing charges to really put a stop to him. (Yet.) And when he gets caught, he doesn’t seem to really care—he just smiles and acts a bit nonplussed by the whole situation. Amazing. So keep your eyes peeled for this grinning charlatan, and let’s stop this cycle of restaurants being repeatedly ripped off by this guy. The brunch burger at Sweet Woodruff. Photo from Facebook. Chinatown jook shop Hing Lung closed three years ago, and lots of construction followed, along with a change in ownership. Now, the intrepid Chowhounders who have been closely monitoring the space’s progress are reporting that it’s open. It has a new name, ~CAFE BROADWAY~. No word on the menu quite yet, but here’s hoping for jook! 674 Broadway St. at Stockton. Back in January, we reported that ~CHARIN~, the haute pop-up from Charles-C Onyeama, had a new home at Stable Cafe. Well, that space flooded back in December (that stretch of Folsom Street has been known to flood regularly), and they had to cancel their pop-ups in January and February. They’re back in business, though, with dinners on Sunday March 15th and Monday March 16th. There are also dinners scheduled for April 19th and 20th, and May 17th and 18th. Check out the menu for March here and make reservations here. The tasting menu costs $128 per person, not including wine pairings and a 20 percent service charge. 2124 Folsom St. at 17th St.
Noe Valley Blog reports that ~HAPPY DONUTS~ in Noe Valley has reopened after a rather mysterious closure. The menu appears the same, and commenters are saying the doughnuts even taste the same. Thank goodness. 3801 24th St. at Church, 415-285-5890. After a temporary closure in February due to water damage, ~SWEET WOODRUFF~ is reopening on Friday March 13th. According to a post on Instagram, they’ll be offering half-off specials on their grilled cheese, burgers, and soup all day long. 798 Sutter St. at Jones, 415-292-9090. 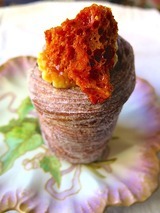 The famed cruffin from Mr. Holmes Bakehouse. Photo: © tablehopper.com. 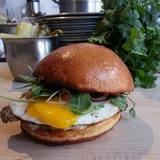 Noe Valley’s ~NOVY~ opened softly over the weekend, according to their Facebook page. The grand opening is this Saturday March 14th. As we reported in February, the new project is a family affair from John and Vi Gianaras and their two daughters, Kristen and Kathryn. The menu offer meze, burgers, salads, and pasta; they also serve brunch on weekends. Hours are Mon-Fri 11am-9:30pm, Sat 9:30am-9:30pm, Sun 9:30am-9pm. 4000 24th St. at Noe, 415-829-8383. Did you hear about the break-in at ~MR. HOLMES BAKEHOUSE~ last week? If you didn’t, here’s the deal: someone broke into the shop on the night of February 26th and stole all of pastry chef Ry Stephens’s recipes from binders. All their expensive bakery equipment, an iPad, computers, and even cash remained untouched, however. The The New York Times even picked up the story. While the press coverage of the incident can only be good for the bakery’s already surging popularity, Stephens is upset with the break-in, quite understandably. We’re so sorry, Ry, and people, please, stop it. 1042 Larkin St. at Sutter, 415-829-7700. There’s a new chef and menu at ~LA MOVIDA~, the casual wine bar in the Mission. Now at the helm is Scott Carrelli (he has worked at Bar Agricole and Delfina, and most recently at the Dark Horse Inn in the Excelsior), offering a mix of eclectic California-inspired cuisine. There are plenty of small plates if you’re just looking for a bite to pair with a beer or glass of wine. On the menu: his famed kimchi Reuben, pickled curry deviled eggs, baccala croquettes, a polenta bowl with fonduta and sous vide egg, and mac and cheese with seasonal mushrooms and house-smoked chicken. Look for eight rotating items, with two or three nightly specials. Brunch will be relaunching at the end of March. A neighborhood friend let us know that ~ALA ROMANA~ in Nob Hill has closed, and Yelp confirms the news. It looks like the space is for lease. 1098 Jackson St. at Taylor. Remember back in 2013 when we told you about the New Orleans project from the owner of local ~PIZZETTA 211~? Well, ~PALADAR 511~ has officially opened! The Times-Picayune has a full story, along with photos. Congratulations, all! 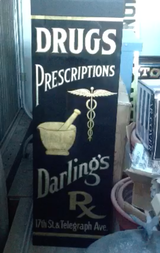 511 Marigny St. at Decatur, New Orleans, 504-509-6782. Check Out Some Great Food Films (and More) at CAAMFest! 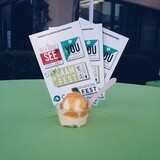 CAAMFest tickets, along with Masumoto Family Farm’s peach sauce on Frozen Kuhsterd. Photo from Facebook. CAAMFest (which was formerly known as the San Francisco Asian American Film Festival) is taking place Thursday March 12th through Sunday March 22nd in various locations in San Francisco, Oakland, and Berkeley. The festival includes lots of great food-related programming, including some screenings you won’t want to miss (more below). There is also a whole lineup of food-oriented events and plenty of films and events to check out. Most tickets are $14 for the general public, $13 for students, seniors, and disabled adults, and $12 for CAAM members; find the full festival schedule and details here. On Thursday March 19th at 7pm, catch Supper Club at New People Cinema. Director Edmond Wong follows chef Alvin Leung as he visits restaurants in the Bay Area and has in-depth conversations about the food industry and cultural identity. Oh, and there’s plenty of gorgeous food to gawk at, too. Details and tickets here. The Masumoto peach farm is the focus of Changing Season: On the Masumoto Family Farm on Friday March 20th at the Oakland Museum of California. The screening is at 7pm and tells the story of a year at the family farm in the Central Valley. The Masumotos will be in attendance, and there will be a conversation about the film. Details here, rush only. These are just few highlights of the festival, but there is tons more to check out. Don’t miss out! Chef Carlo Middione. Photo by Daniel Bahmani via the New Fillmore. The evening begins at 6:30pm with cocktails and passed hors d’oeuvres, followed by a multicourse Italian feast complete with wine pairings. Check out the planned menu here. The dinner is $150 per person and includes all food and beverages, though not tax and gratuity. Reservations can be made by calling the restaurant. Lobby Level, InterContinental Hotel, 888 Howard St. at 5th St., 415-616-6566. Chicken, waffles, and scrambled eggs at Gussie’s. Yelp photo by Lily Y. After reporting the sad news in January of ~GUSSIE’S CHICKEN AND WAFFLES~ closure in the Fillmore, we were so happy to hear that owner Michele Wilson has secured a location in Oakland. East Bay Express reports that she signed the lease on a space in Uptown Oakland, next door to the Paramount Theatre, and will be rebranding the new space as ~GUSSIE’S SOUTHERN TABLE AND BAR~. They will serve breakfast, lunch, and dinner. There will also be a full liquor license and a basement lounge space that will feature music and dancing. The menu, though, will remain mostly the same, and prices should stay relatively low, less than $18 per dish. They have to build out the space completely, but are aiming for a September opening. 2021 Broadway at 21st St., Oakland. Paleo diners and others on restrictive diets rejoice! You now have new place to eat out in North Berkeley, called ~MISSION: HEIRLOOM~ (which is an interesting name for a restaurant not located in the Mission and not associated with Heirloom Café). It comes from husband-and-wife team Bobby Chang and Yrmis Barroeta, and Berkeleyside Nosh has a nice in-depth story on the project from last July. They are striving to make paleo-style food that is delicious in addition to healthful. They are offering bone broths to go as part of their “Counter Basics” line, either for sipping or taking home, as well as serving breakfast, lunch, dinner, and dessert. They are also selling lots of meals to take home for those short on time on Good Eggs. The partners have also put a great deal of work into keeping their facility as “clean” as possible, including a negative ion air purifier and reverse-osmosis water-purifying system. If all of this is sounding like the pilot episode of Berklandia, well, you’re not wrong. But some of their menu items, like the lamb nettle stew, sounds downright delicious, no matter what you do or don’t eat. Current hours are Fri-Sun, Tue 11am-9pm. 2085 Vine St. at Shattuck, Berkeley, 510-859-4501. Preeti Mistry’s ~JUHU BEACH CLUB~ has nabbed a full liquor license, is celebrating its second anniversary, and it’s Holi! So many reasons to party! Join them on Sunday March 15th from 11am to 3pm for a good time. All drinks will be $5, and there will be some free food. Be sure to wear white and get lots of colored powder thrown at you! Jen Biesty of Oakland’s ~SHAKEWELL~ is going to be appearing on television! The Top Chef alum is going to be on The Food Network’s Beat Bobby Flay, with airings this Thursday, Friday, and more. Don’t miss it! Steve Carlin, the developer behind Napa’s Oxbow Public Market, has partnered with Jack London Square Ventures and the Port of Oakland to bring ~WATER STREET MARKET~ to Jack London Square in Oakland. The new project is opening at 55 Water Street and will include 32,000 square feet on the ground floor, with additional office spaces totaling 110,000 square feet above. There’s no official timeline yet, but fair to say it’s still a ways out. 55 Water St. at Franklin, Oakland. Feastly gives you free access to supper clubs, up-and-coming chefs, and pop-up restaurants in the Bay Area. These events bring together food-focused diners around a shared table for an unconventional dining experience. We know you’ll love it but on the off chance you don’t, Feastly will refund 100 percent of your ticket. Grab your seat at the table before someone else does. To get 10 percent off any meal in March, use code: tablehopper. Bites at Taste of the Nation 2013. Photo by Eric Fong via Facebook. The annual Taste of the Nation event is coming up on Thursday March 26th at the City View at The Metreon. This important event benefits No Kid Hungry, a nationwide organization that strives to end childhood hunger in America. A seriously impressive lineup of restaurants, led by Michael Tusk (Quince, Cotogna), will be serving bites all night, including Alta CA, Chino, Marlowe, Ichi Sushi, and Causwells. There will also be plenty to drink, including local winemakers like McEvoy Ranch and Darioush, spirited selections including Angel’s Envy and St. George Spirits, beer, and, of course, lots of fabulous company. The event begins at 6:30pm for general admission and 5:30pm for VIP ticket holders; tickets are $125 for general admission or $250 for VIP, which includes early access, a special gift bag, and valet parking. For a special 20 percent discount for tablehopper readers, use code: 2015MEDIACOMP. All proceeds (that would be 100 percent) benefit Share Our Strength’s fight against childhood hunger. The City View at the Metreon, 135 4th St. at Mission. The culinary prince of Denmark, none other than ~René Redzepi~, paid San Francisco a visit last week, and it appears he hung out with some of our treasured chefs too. According to a tweeted photo, he was hangin’ with Chad Robertson, Daniel Patterson, and Roy Choi at the future home of Loco’l, Choi and Patterson’s upcoming fast-food restaurant. Then, he dined at Cotogna, where he enjoyed a quiet dinner with his wife. Apparently the pair is in the Bay Area on holiday. 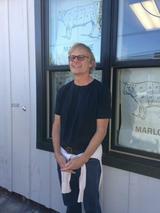 His whirlwind tour also included a stop at Saison, where a reader spotted him with Daniel Patterson. Some members of the cast of Community were spotted at State Bird Provisions last Friday. ~Danny Pudi~, ~Joel McHale~, and ~Gillian Jacobs~ were reportedly all in attendance. According to Twitter, they were in town meeting with Marissa Mayer at Yahoo! about the upcoming season of Community, which was picked up by Yahoo Screen.